Selling on Amazon has become an extremely popular way to make money online. In fact, there are over 1.7 million third party sellers and that number grows every day. Now, one fifth of all Amazon sellers are selling more than $1 million per year! This means the time to get into this venture is now. Don’t waste anymore time and look back at what could have been. If you’re going to become successful at selling products on Amazon, you will need to get educated on how to create a successful business. This means you will need to take some type of Amazon course. That being said, not all Amazon courses are created equal. You want to find the very best Amazon course. We have reviewed many of the top Amazon courses on the market. If we have not written a review yet, you can be sure we have looked at it and know what makes it tick. Before you choose which Amazon course is best for you, you will need to understand the different ways you can sell products on Amazon. One way to sell on Amazon is to private label your own products under your on brand. Private labeling is the process of finding a supplier or manufacturer of a certain type of product and then having them place your label and brand on it. You then sell it on Amazon under your own brand. Private label is an amazing way to not only sell on Amazon, but to even create a brand off of Amazon! You can sell your products on any ecommerce platform you wish such as Walmart.com. You can even start your own store through Shopify. Using private label as the means to create a business and sell products on Amazon can be very lucrative. Scott Lindsay the founder of VETTED OPPS used private label to create two million dollar brands and to make over $1.4 million profit in 18 months! This is by far the best way to get started selling products on the Amazon marketplace. The concept is simple, you find suppliers of brand name products and then get wholesale accounts with these brands so you can buy wholesale and sell retail. Although the concept is simple, you will really need to get educated on how to make this all work. There are many people creating very large businesses using this method. The concept of retail arbitrage is simple, find products on sale in stores such as Walmart, Target, etc… and then to sell them on Amazon at a higher price. Online arbitrage is similar to retail arbitrage but everything is done online. This means you will be scanning online stores for sales and pricing and then buying items to sell on Amazon for a profit. We do not recommend selling on Amazon by retail arbitrage or online arbitrage. With some of the more recent Amazon changes you have to be very careful when selling brand name products that you have not been approved to sell by the manufacturer or brand itself. If they complain, you can have your Amazon account suspended. Now, this is not to say that using either of these methods does not work. There are plenty of people still making money using retail arbitrage and online arbitrage. We just do not recommend it any longer because of the risks. You might be thinking what’s the difference between arbitrage and selling branded products wholesale? There is a major difference. Selling branded products wholesale means you’re getting approved by the brand to sell. This means if Amazon asks if you have permission, you can prove that you do. How Do You Choose The Best Amazon Course? Now that we see there are many ways to sell on Amazon, let’s identify the best Amazon course for you. Since there are so many Amazon courses on the market, it’s very hard to know which ones are good and which ones are bad. Our goal in this guide is to help you choose the best Amazon course that will teach you what you need to know to become a success on Amazon. If you’re looking at an Amazon course and it does not match at least four of these criteria, don’t join! If you have made the decision to sell on Amazon using private label, then the best Amazon course for you to take is The Amazing Selling Machine. (READ OUR COMPLETE AMAZING SELLING MACHINE REVIEW HERE). The Amazing Selling Machine is by far the best course to teach you how to sell with private label on Amazon. There simply is nothing else like it on the market. Yes, you will hear some people say it’s too expensive and not worth the cost, but we do not believe this at all. The Amazing Selling Machine has the very best course material available. Each section features step by step VIDEO tutorials as well as other downloadable materials needed to help you run your business at full steam. Learning is so easy with the streamlined course interface offered by The Amazing Selling Machine. Many courses have a clunky, disorganized layout but The Amazing Selling Machine features a course web console that truly makes learning fun. 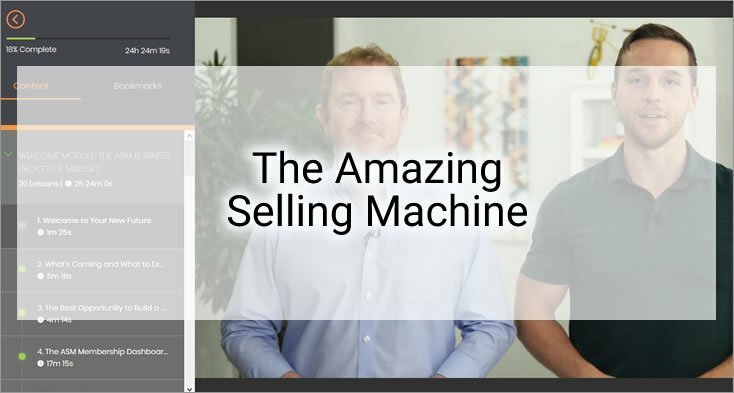 The Amazing Selling Machine is one of the only Amazon courses that is constantly updating their course to reflect all of the current Amazon changes. This means you’re always on the cutting edge of what works on Amazon. Since Amazon is always making changes, it’s crucial to have a course that makes updates as well. The Amazing Selling Machine updates their course about once every year. Since 2013, they have updated every year. They’re currently in their 9th update. The best part is once you sign up, you get access to every course update at no extra charge. The community of other sellers is outstanding. You can ask questions, get answers, and interact with other sellers who are also involved in growing their own businesses. The internet can be a lonely place so this is truly an amazing feature. The support offered by The Amazing Selling Machine is top notch. If you have an issue or question, simply open a support ticket and you will have an answer normally within a few hours. The Amazing Selling Machine offers a 60 day full money back guarantee. There is nothing to lose and everything to gain by signing up. If you’re looking to sell on Amazon with private label, this is the best Amazon course you could ever take. In fact, this is the same course that VETTED OPPS founder Scott Lindsay took to make $1.4 million profit in 18 months! This course is taught by Beau Crabill. Beau is an amazing young man. He started selling on Amazon at the age of 15 and today at the age of 20 is one of the most successful Amazon sellers using the strategy of buying name brands wholesale and selling them on Amazon for a profit. In fact, the last time we spoke to Beau he had done nearly $300,000 in revenue in one month! So he knows what he’s doing. You may think it’s so easy to learn how to buy name brands wholesale then sell them for a profit. However, there is much to learn to do things correctly on Amazon. It’s also hard to locate the correct sourcing for products and then to do it all right. Online Retail Mastery will teach you all of this and much more! 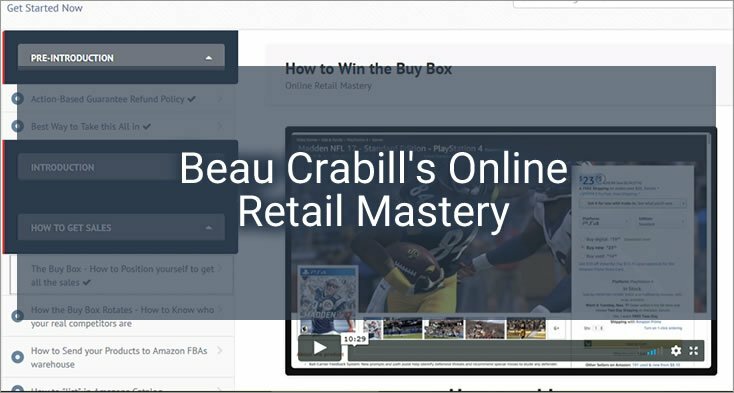 Once inside Online Retail Mastery you will gain access to step by step guides that will teach you everything you would need to know to run this type of business successfully. The entire course is laid out in a user friendly format and is composed of all video tutorials. Beau also updates the course regularly to keep up with the constant changes on Amazon. If you need help, it’s so easy to email Beau and he always answers within a few hours. Plus, Online Retail Mastery offers a 30 day action based money back guarantee. If you’re looking to buy hot brand name products for wholesale and then sell them on Amazon for a large profit, Online Retail Mastery is the best course for you. There are probably close to one hundred other Amazon courses on the market. However, it’s tough to find those that are good. Either the material is lacking or it gets outdated very quickly. The two courses we listed above are truly the best Amazon courses on the market to help you succeed. We hope you take advantage of the opportunity available on Amazon.